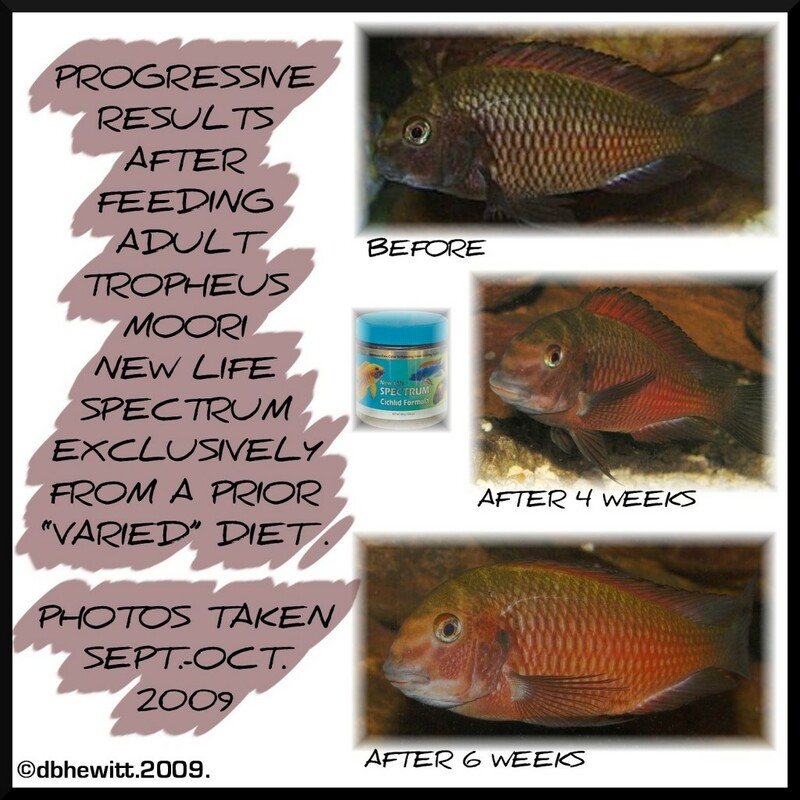 New Life Spectrum – See The Results! You’ve got to be joking, right? I mean I’ve read lots of stuff about feeding fish and all the books and magazines say to feed a varied diet of “quality” flakes, feed sparingly, don’t overcrowd your tank and if you do REGULAR AND FREQUENT WATER CHANGES you will be rewarded with a happy little fish and years of wonderment and fascination in the world of fish keeping. Well, I want to be the best fish feeder around and make my little fish just as fascinated with me as I will be with him so I get the best fish food I can find at the pet shop. I haven’t been a fish keeper for years but I’ve done my time with a goldfish or two now and then, but now I’m going in headfirst and darn it, I’m gonna serve only the best! I’ve researched what each species eats in the wild, what makes them want to breed (’cause I want to have baby fishies) and what foods make their colors so pretty. I know that carnivores eat meat, herbivores eat vegetables (certainly NOT meat) and omnivores eat anything. 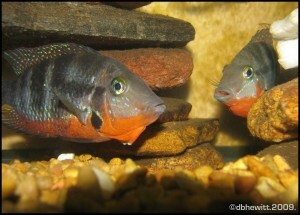 I’ve also learned that Lake Malawi cichlids (I told you I was going in headfirst) are strict herbivores that eat algae and that meat will give them Malawi Bloat and will die. So I buy algae wafers and spirulina algae flakes. Well, my little fishies look pretty nice in their stripes and everything so I know I’m doing a good job. Sometimes I’m even fascinated – they look so pretty. But now you tell me there’s a better food that all kinds of fish will eat and will look, act and be healthier? You’re full of baloney. So, there I was…skeptical to say the very least. However, a few days later I read an article written by a professional fish keeper I respect and he stated that his fish all are fed Spectrum fish food exclusively. Nothing else. Ever. Period. 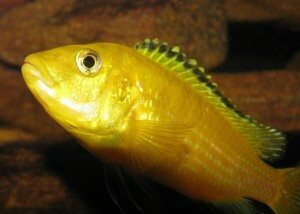 Even his Lake Malawi mbuna. How can this be I wondered. His fish are show winners. 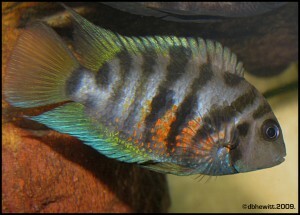 They have to eat algae and algae only. They can’t eat the same fare as plecostomus catfish, pacus, and oscars. But they do he told me. Not only do they eat it but they thrive. OK, I’m all for trying something new and hey, gotta vary their diet, right? So off I go to the pet shop to buy some. However, apparently the makers of Spectrum don’t advertise much and their product is only available in top-of-the-line aquatic supply shoppes and via the Internet. Well, to make a long story short, I managed to get some and then researched the New Life website on proper feeding directions. The next day I began my month-long exclusive feeding of Spectrum. Doggone! The fish went bananas! Even the finicky eaters and the juveniles who don’t stray out with the big boys much – especially at feeding time. In two weeks and after I returned from vacation, I couldn’t believe what I saw! All, I mean ALL of my little fishies (adults too) looked amazing! Colors I didn’t know they had began to gleam. All my mbuna were frolicking together happily, no one was hiding and they all looked, er, healthier than I expected after my absence. I was told I’d begin to notice improvements in about two weeks. Heck, in two weeks I hardly recognized my Tropheus! After a month I was ready to take them to shows! Anyway, six weeks on and the improvements are still continuing and my Firemouths (who have tried spawning for 2 years to no avail) have finally succeeded! Not only once, but TWICE in six weeks! I won’t go into all the details of how and why Spectrum works, their website answers all those questions better than I, but it does! I am a true believer now and yes, I AM fascinated and in wonderment not only with fish keeping and my little fishies, but with New Life Spectrum! I encourage everyone who has a fish tank or tanks to get some Spectrum today and feed it exclusively to your fish. Just look at these photos and judge the effects for yourself. You, too will be fascinated. Not affiliated in any way with New Life International Inc.